Industries spread out over all the old manorial lands, wreaking havoc with the landscape. Agriculture was not entirely excluded but, by the second half of the 18th century, it took place in the gaps between mining and manufacturing – and these gaps gradually became fewer though they did not disappear entirely until late in the 20th century. Of this period Dr. Rowlands says of Bilston: “Here in the course of the hundred years before 1760 new trades, new men, new wealth and a new way of life were established. … In 1666 there were only 46 householders paying tax and 61 certified as exempt. Thirty years later in 1695 a list of the population for taxation purposes names 1006 men and women and children, including a high proportion of young single men. … In 1767 a return estimated the population of [Bilston] chapelry as ‘about 5,000’, that is, about ten times that indicated in the hearth tax return of a hundred years before”. Joseph Price, writing of a time about 1780, says “The principal Trades at this time carried on in Bilston were the Buckle and Chape, the Japan, the Enamel and the Metal Box, vast quantities of which were Manufactured here”. Cut steel buckle and chape. The chape is the operative part at the back with the prongs. Typically the chape was made in Bilston and the ring (the part at the front) was made in Wolverhampton. Clearly the industrial revolution had hit Bilston and by 1760 the town and its people would have been largely unrecognisable as the town and its people in 1660. What is not clear is why this occurred. Geographical and geological determinism never were satisfactory explanations and their shortcomings are illustrated by the contrast Dr. Rowlands shows between Bilston and Sedgley, a place similarly situated but where the course of development was quite different. In 1727 Bilston’s communications had been somewhat improved by the passing of the first Turnpike Act to include any road in the area. Eventually most of the roads out of the town were turnpiked and the town was surrounded by toll gates. Under an Act of 1776 the road from Bilston to Wednesbury was created, the road originally having gone via Darlaston. The point where what is now Oxford Street crossed the brook was almost certainly a ford; eventually it was crossed by Goddard’s Bridge, the original date of which is unknown but the records show its being repaired in 1670. Bilston lay on the Holyhead Road and was certainly a staging post on the coaching route, though probably not a major coaching centre, that role being taken, locally, by Wolverhampton. Most road traffic was in the form of mules, horses, wagons and carts. 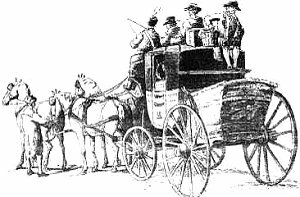 The romantic heyday of the stage coach was quite short lived, from the end of the eighteenth century to the coming of the railways. The roads themselves were probably not as bad as we tend to think - they actually worked. But industry would have been given a great boost by the coming of the canal in 1767, making it easier and far cheaper to distribute (and receive) raw materials and finished goods. Joseph Price wrote that the canal “had been of vast importance to the Proprietors of Lands and Mines in this Town and the Neighbourhood: Blast Furnaces for the smelting of Iron began to be erected about this time in this Township, the first of which was that belonging to the late John Wilkinson Esq., near the Fireholes, and called the Old Furnaces; another was erected by the same Gentleman close to the canal at Upper Bradley, and one at the Western extremity of the Township by the late John Bickley Esq,”. There were other improvements to the town. The Rev. Ames records a new burial ground being created; some of the town ways being paved; and, partly at the cost of Ames himself, a Poor House was established. 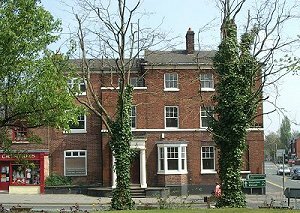 This workhouse was established in 1700 and stood in Workhouse Fold in the town centre. The Ivy House today seen from the new burial ground. This house is one of the few survivors of the many Georgian houses built in Bilston, reflecting the increasing wealth of the town. (Joseph Price works out a population of 3,875 for 1771 which is significantly more than one would have expected from Lawley's figures. But the general trend is unaffected - the increase in population accelerates from the end of the 18th century). These figures show the enormous increase in population and they suggest the problems that brought with it. They also reflect the changing economic climate, the 19th century being particularly prone to periods of boom and bust. Lawley says that since 1871 (and he writes in the 1890s) the population has decreased to a little over 24,000, because the coal mining industry was almost at an end and the iron trade was in deep recession. In the 18th century the town was already beginning to show some of the drawbacks of industrialisation, overcrowding and poor drainage and sanitation. In 1728 and 1729 an “epidemical distemper” of an unknown sort caused a great mortality, with 172 burials being recorded in just two years from a population of about 1,000. In 1756 and 1757 they were other epidemics, this time of “putrid fever” or “flux of fever”. In 6 months this took off 51 people. The parish registers show that the town had a Constable but his powers were distinctly limited. In 1694 the registers first record the installation of a pair of stocks, but these were certainly not the first. They had to be repaired from time to time and replaced completely in 1764. The stocks were in Lich Gates, where they stayed until moved to the headquarters of the new Peelers when they were established. How badly you were pelted with rubbish depended on what the locals thought of you and your offence. 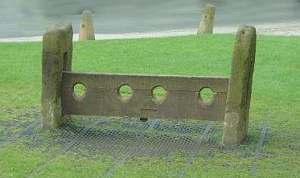 The main purpose of stocks and pillories was to humiliate the offender. It should be noted that the presence of a gibbet is not evidence of sentences being executed and criminals hanged in Bilston. It was only after you had been hanged (probably in Stafford) that your body was hung, in a metal cage, upon a gibbet, preferably near to where you came from or committed the foul deed. The image shows a seaside gibbet, probably displaying a pirate or mutineer. "Shepherding the moonlit sheep" was a warning to others as much as a post mortem humiliation. In 1719 a new house was provided for the curate of St. Leonard’s. The Rev. Ames moved in on the 9th May. The house stood “on the Church Street side of the churchyard, opposite the entrance to the grounds of Pipe Hall Hotel”. It moved from there in 1820, to a new building next to the church near the Mount Pleasant junction. The new house of 1719 was said to be near the school. Presumably this was a church school, possibly just a Sunday school. There seems to be little other reference to education in Bilston up to this time but doubtless there were a number of private schools and dame schools. The town was not without entertainment. The ceremony of beating the bounds continued until 1827. The Gunpowder Plot was celebrated each 5th November, as was the Restoration of Charles 2nd each 29th May. Both occasions brought forth bonfires, fireworks and a good deal of drinking. “Bilston is a town that consists mainly of factories for metal boxes and other and punched work which comes under the heading ‘toy ware’ or ‘Quincaillerie’ [small metal goods]. I viewed here one or two of these works, where the people were occupied with the making of paste gems and enamelled work to be incorporated into boxes and watch chains and with the filing and carving of mother of pearl. Of this ware I was shown a set of tea caddies and boxes, which cost 60 guineas. For purchase of half-a-dozen or a dozen of these items a discount of 15 per cent is allowed”. “In one farmhouse between Bilston and Wolverhampton there was a factory for making snuff-boxes and other enamelled work, where a large number of women were employed in preparing the enamel, dipping the copper sheets and painting. They were also occupied in firing and tempering the enamel … Later on I saw a factory making the same things in Wednesbury and there are also a large number of them in Bilston. The boxes fetch good prices when sold, according to the quality of the painting. A discount of 15 per cent is allowed if one takes a dozen or more”. 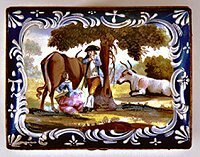 Handpainted enamel boxes like this were typical of Bilston wares. It was mostly a cottage industry but some larger works appeared. Image by permission of and copyright of Wolverhampton City Council and not to be reproduced without their permission. 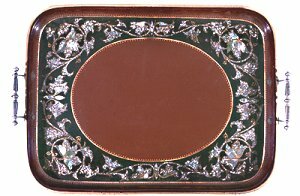 A japanned tray. Bilston mainly japanned on plate metal, not papier mache. The town made vast numbers of blank trays, many of which were sold on to Wolverhampton japanners. Angerstein was only interested in industrial production, but Lawley, Price and Page all quote a description of Bilston, made in 1790, by an American who passed through the village and who provides a more general picture. None of the writers who quotes this passage says where this description originated but, as they all used it, it might as well appear here. "The Chapel is a modern edifice, though built on the foundations of an ancient structure. It is covered with slate, has a square tower of brick, and contains six bells. There are likewise a dissenting chapel and charity school. The principle Inn is the Bull, and the population, recently much increased is 4,800". By 1800 the whole nature of the town had changed, from a modest agricultural village to a stirring giant of industry. As we will see the town now did not have any governmental structures in place to deal with this radically changed situation. By this time the manorial courts had largely fallen into disuse, only operating – and probably not all that well – to register dealings in copyhold land. The magistrates, at Petty and Quarter Sessions, continued to play an important role, but mainly limited to dealing with such crimes as came before them from a town which lacked a police force. Wolverhampton's town crier, Percy Simmons. The traditional dress of the town crier is a left over of the 18th century. Its colour and style is not prescribed anywhere and, these days, is left largely to the whim of the individual crier. Although a crier was also known as a bellman, even the bell was not a necessity - a horn might be used instead. After making a proclamation the crier would usually post copies of it around town. Criers fell out of use with the the widespread use of printing, the development of newspapers and the coming of radio and television. But public proclamations of events such as the death of a monarch continued to be cried but they were often read by the Town Clerk. Most of what had been done by way of governing the town, had been done by the Vestry of St. Leonard’s – in effect a committee of the chief men of the town – but the Vestry had very limited powers to deal with the new challenges. Everything that was done was done by what were, in effect, the voluntary efforts of those with an interest in improving the town. Dr. Rowlands, referring to the “new men”, including the enamellers Dovey Hawksford and John Bickley, says: “From about 1730 it was these men who took the lead in local affairs. They continued to fight for independence from the mother church of Wolverhampton, secured a new independent burial ground, restored the chapel several times, provided it with new bells and new fittings, including a fire extinguisher, and improved the surrounding paths and grounds. They built a new house for the curate, to which, at a later date they added ‘a necessary house’. In order to ‘augment the curacy’ they leased church lands to Burslem Sparrow, the coal-master. They built a crib, a new workhouse, appointed a crier and a schoolmaster. They used their business contacts in the service of the chapelry and themselves subscribed generously to the new undertakings”. All of which is, no doubt, very commendable, but Dr. Rowlands also quotes the contemporary observer, Dr. Wilkes, who complained: “this village of Bilston, for want of some liberal person to govern it, is very irregular and many robberies and some murders have been committed by persons belonging to it, though great sums of money have been brought thither by toys”. Bilston was already getting a reputation.